What an amazing & astonishing year it has been for our PLN (that's you, too dear reader! 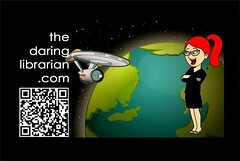 ), Geek Tribe, & Librarians! So many of our tribe have been recognized by the Edublog Award Nominations for our achievements in the last year - it's astonishing! This posting is an unashamed and repentant thank you & celebration of what we ALL have done in the last year. Fakey false-modesty is NOT how I roll. To all those who are looking at this blog because it was nominated - Hi! How you doin? I use these !!!!! 's and AWEsome a lot....or as Bob Edwards of NPR recently said of me after an interview that I "speak almost entirely in exclamation points." Heh heh heh Like Elaine Bennis in Seinfeld - yeah...I own it. Please take the time to review the shortlisted nominations & vote. You can see who I nominated at My Nominations For The Edublog Awards 2010. I value the Edublog awards because it is a crowdsourced recognition from your peers, a chance to pay it forward to those who have inspired you in the past year, & great way to stuff my Google reader with wonderful new voices! "We are stronger when we share!" I was SO honored to be nominated in the Best Library/Librarian Blog category (thank you to Shelly Terrell and all of you who nominated me! ), but the really important thing about these awards is that they provide an opportunity for everybody to learn about great blogs and other resources out there that can be helpful to our teaching. Last year my blog was named Library Tech Musings...and then in April I made the huge jump and re-named it The Daring Librarian blog. It was a dare to myself - to brand myself, yes...but mostly as a reminder that I - we - as educators, must always be DARING to give our all...to take daring chances...daring to the fight filters, the naysayers, & negative forces, for our most important customers...our Students! As always I wish I could be all diddy cool, rico suave, & smooth about these nominations - but that's just not how I roll. I can't! I'm jumpin up & down, going SQUEE! 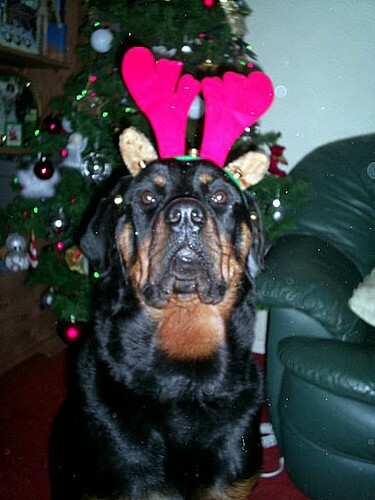 out loud (gave poor Bruno the Rottie at left quite a start) and on the phone with my Mom right away! I'd Be Honored to Have Your Vote! To be nominated for the Best Librarian/Library blog with the likes of my mentor Joyce Valenza and Buffy J. Hamilton & the rest of the Geek Tribe is staggeringly AWEsome & amazing to me! I'd be honored to have your vote! To have the Daring Librarian blog nominated for Best educational use of video / visual gobsmacked me! Sure, I've uploaded some videos to my YouTube channel...Yes, I use pics wherever I can.... I guess my pathological Photoshop addiction is paying off in a different kinda way! Or maybe it was for my growing collection of Comic Tutorials At-A-Glance - whichever...Thank you! I'd be honored to have your vote! To have the MHMS Tech Wiki nominated for Best educational wiki That wiki has been recently re-named and reclaimed just flipping blew me away! (Confession: BIG MISTAKE or why you shouldn't register wikis under your school name but your own or your brand!) So after nearly 5 years I just re-named it the Daring Librarian's Steam Powered MHM Tech Wiki in a Digitally Shifted World (whew!) Like What the What!? That's SO AWEsome! Thank you, thank you, thank you!!! That's the sandbox i started in '06 for my school & teachers when it comes to everyday technology PD! As always, take, use, share! I'd be honored to have your vote! Team Nominations that I'm connected to and feel passionate about & hope to win you over, too! Best educational webinar series: The TL Virtual Cafe was created by Joyce Valenza & the Geek Tribe and is committed to creating FREE transformative conversations about teacher-librarians, educational technology, and collaborative connections to facilitate meaningful and lifelong learning skills. These conversations occur during FREE Webinars utilizing Elluminate generously donated by Learn Central and Steve Hargadon. Hi! I'm the Julie McCoy (LoveBoatReference, Score!) of the TL Virtual Cafe. After Joyce created it, found us a home thanks to Steve, I volunteered to help manage & run it. It's been fun! But this amazing endeavor is really a group effort. We've had amazing speakers donate their time & talents and we've had hundreds of participants show up! All the past webinars are archived so If you want to go re-live one feel free! Please consider voting for the TL Virtual Cafe for Best educational webinar series. Thank you! We'd be honored to have your vote! 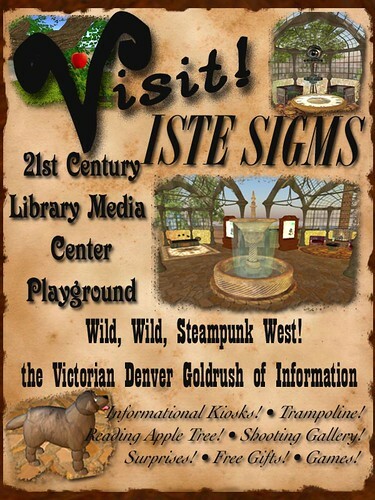 Best educational use of a virtual world: ISTE- SIGMS 21st Century Playground in Second Life - Talented builder Linda Dougherty (aka Eleanor Anderton- SL) created a Victorian virtual playground in second life for ISTE10 that was detailed, informative, and beautiful. She even created a collectors ISTE-SIGMS garden clock as a giveaway!. It was also just really cool..(full disclosure, I helped a little with this - donating furniture, creating a ISTE Tophat giveaway, and my giant Telescope - but the main builder was the amazing Linda) Thank you! We'd be honored to have your vote! Congratulations to everyone and let's embrace & welcome our new voices and recruit new Geek Tribe members! And no matter who wins the Edublog awards -- really, we all win! photo © 2007 Darren Stone | more info (via: Wylio)Ooooh! Tech Tip! The graphic at the very top of this posting was from Wylio: a Creative Commons Image site where you can search for images, re-size and align them, and get the instant Attribution code all in ONE EASY STEP! or as they say it: "Wylio is the original, defacto, extra crunchy, all-in-one picture finder and re-sizer made specifically for bloggers. We are the quickest way for you to get a photo into your next blog post." Sweet! We would love you no matter what the motive, Gwyneth... but here is a chance to give praise where it is evident and overdue. Whether a source of inspiration, a challenge to view things from a new perspective, or a breath of fresh life and focus into an overwhelming and exciting world... you, my friend, know how to spin it and know how to speak it. Lots of love (and, of course, hopes for votes along with)! Awww Matthew...you just made my night! Thank you dear!...and I'm so happy you're part of my PLN, Geek Tribe, and school district!!!! I get to SEE you - not as often as I would like! but still without a plane ride! YAY! As a brand-new librarian assistant who is trying to bring lots of cool 2.0 tools to our elementary school, THANKS!--I've learned so much from your blog and it's FUN! Links like The Maccabeats--I don't get that at any other library blog! Thank you Barbara! It's important to me to bring learning, fun, & libraries together! I'm so happy to hear that you are enjoying it! YAY! Celebrating Diversity- A Capella & Viral Style! Livescribe Pencast Book Reviews & More!